Rugged, Full-featured Handheld with GPS, GLONASS and Wireless Connectivity 2.6" sunlight-readable color screen High-sensitivity GPS and GLONASS receiver with quad helix antenna 1-year BirdsEye Satellite Imagery subscription 3-axis compass with barometric altimeter Wireless connectivity via Bluetooth® technology¹ or ANT+™ GPSMAP 64s GPSMAP 64s features a 2.6” sunlight-readable color screen and a high-sensitivity GPS and GLONASS receiver with a quad helix antenna for superior reception. GPSMAP 64s includes a 3-axis electronic compass with barometric altimeter, wireless connectivity and a 1-year BirdsEye Satellite Imagery subscription. Get Your Bearings GPSMAP 64s has a built-in 3-axis tilt-compensated electronic compass, which shows your heading even when you’re standing still, without holding it level. Its barometric altimeter tracks changes in pressure to pinpoint your precise altitude, and you can even use it to plot barometric pressure over time, which can help you keep an eye on changing weather conditions. Share Wirelessly Share your waypoints, tracks, routes and geocaches wirelessly with other compatible devices. Your friends can enjoy your favorite hike or cache without waiting for you to plug in to your computer — simply press “send” to transfer your information to another Garmin handheld. GPSMAP 64st also connects to compatible Garmin devices, including VIRB™ and accessory sensors, including tempe™, foot pod and heart rate monitor. Stay Connected With Smart Notification you can wirelessly receive email, texts and alerts from your compatible iPhone® 4s or later. Stay connected without having to dig into your backpack for your smartphone. Explore the Terrain GPSMAP 64s comes with a built-in worldwide basemap with shaded relief plus a 1-year BirdsEye Satellite Imagery subscription, so you can navigate anywhere with ease. With photo navigation, you can download geotagged pictures from the Internet and navigate to them. 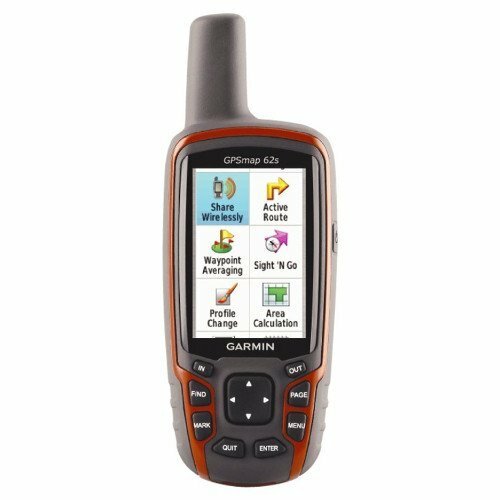 The Garmin GPSMAP 64S GPS Device was added to the GPS Devices category in June 2016. The lowest price GetPrice has found for the Garmin GPSMAP 64S GPS Device in Australia is $349.00 from Sports Watches Australia. Other merchants who stock it are Sports Watches Australia, Gadget City, Ryda Dot Com.